Here are all the news items for 2018. Please visit this link to read our latest newsletter outlining some of our activities over the past few months. 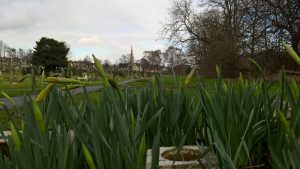 Perhaps Spring is not too far away after all. 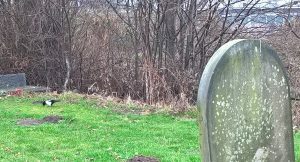 This photograph was taken yesterday at the cemetery. Today’s Working Morning was the 100th volunteers’ work session at the cemetery since the formation of the Friends group. Regular monthly events began in April 2010 and have taken place every single month since then. In addition, four specially arranged litter picks have occurred in recent years. That makes 100 session overall! Quite a milestone, we think. The wet weather didn’t deter the small but hardy band at today’s event. 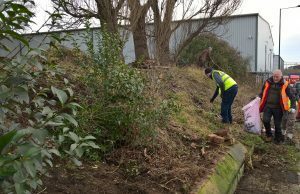 Litter picking and cutting back shrubs were the main activities. 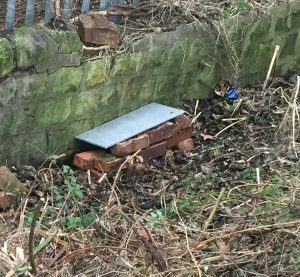 We were pleased to note that Doncaster Council had replaced the burnt-out bin near to the Green Dyke Lane gate (see before and after photos). Thank you to all involved in making that happen. Much less pleasing was the amount of dog fouling evident around the cemetery. It is in a worse state than we ever recall previously. 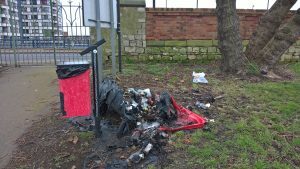 If you see a dog owner failing to clean up after their pet, please report the incident to Doncaster Council on 01302 736000. Due to the adverse weather conditions, we have decided to cancel our planned litter pick this Sunday morning (4th March). 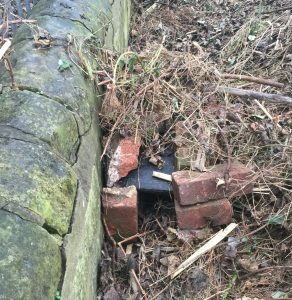 It is unlikely that we would be able to even see the litter, let alone collect it! 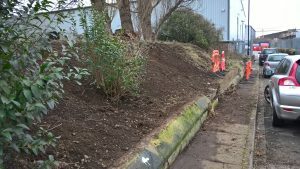 Instead, why not come along to our next scheduled Working Morning, on Saturday 10th March? Please see our Events page for full details. 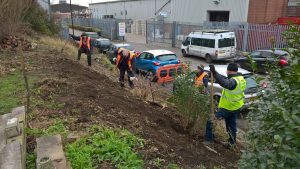 The wintry weather did not deter a hardy bunch of volunteers at today’s monthly Working Morning. Among the group were another two first-time helpers, Ruth and Vicky. They bring to four the number of debutants in the last three months. 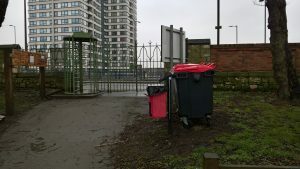 Final tidying up was done after completing the Wildlife Corner at the bottom of the New Street boundary. 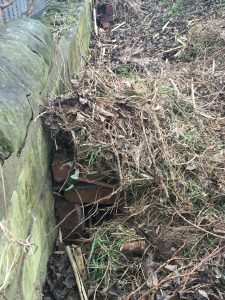 Bricks and green waste recovered from that area were recycled to build hedgehog shelters. Sucker growth was removed and shrubs cut back near to the New Street gate. Finally, a litter pick of the entire site was undertaken. A great morning’s work. Thank you to all who took part. The ‘installation phase’ of our Wildlife Corner project has been completed. Volunteers from The Conservation Volunteers (TCV) finished cultivating the area and then planted hundreds of young plants on Thursday. 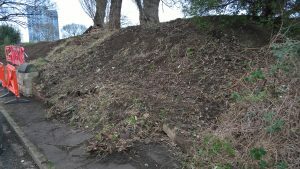 If the new plants have a good spring and summer, we should see much of the slope covered in wildlife friendly vegetation by the end of this year. Our grateful thanks go not only to TCV, but especially to Greggs Foundation, who funded the project via an Environment Grant. 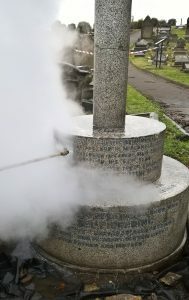 In an action-packed day at the cemetery, as well as the Wildlife Corner project being commenced, we also saw further stone cleaning on the Pickering grave. 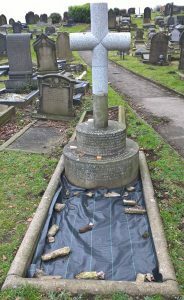 Our friends from Victoria Cross Trust and Stone Revival continued their work on the memorial to William and Alice Pickering. 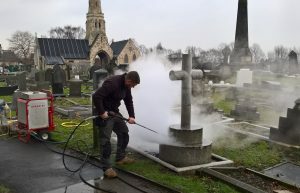 Their DOFF pressurised steam system was used to clean years of grime away from the stonework. There could, however, be a further visit to remove the more stubborn deposits, using the alternative TORC system. 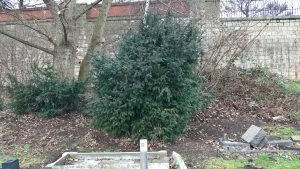 Yesterday The Conservation Volunteers – TCV began their work on transforming the sorely neglected south western extremity of Hyde Park Cemetery into a wildlife friendly corner. Helped by Andy, Nigel and Richard from Friends of Hyde Park Cemetery, the team had a very productive first day. 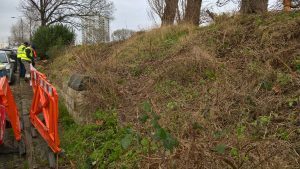 Litter and rubbish were cleared, low value vegetation was removed and much of the 120 sq. 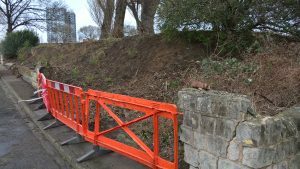 metre slope was dug over. 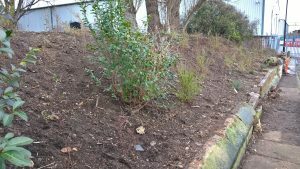 On Thursday the remaining area will be cleared and new wildlife-friendly shrubs will be planted. The photos show progress from the start to the finish of this first day. We are indebted to Greggs for their Environmental Grant to fund this work. We were also delighted to welcome local RSPB members to the cemetery. They have kindly agreed to carry out bird surveys before and after the creation of our Wildlife Corner. The magpie on the photo waited until they had left before putting in an appearance! 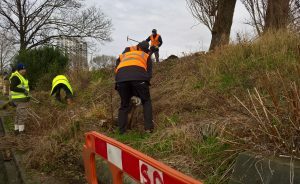 These are typical of the sorts of things that you may be asked to help with, if you join us at a future Working Morning, on the second Saturday of every month. The next session is on 10th February, from 9:30am until noon. Here is a gentle reminder that our next open meeting and AGM is to be held in the meeting room at Club 39, 39 College Road, Doncaster, DN1 3JH on Monday 22 January 2018 at 7:30pm. Please see the map below for how to find Club 39. Car parking is readily available in the Civic Quarter multi-storey car park, just across the road. The club shares its entrance with Sticky Mits Childcare Centre. Just press the button by the door to be admitted. Our guest speaker, Lynsey Slater, will give an illustrated talk on The King’s Own Yorkshire Light Infantry: Stories from the First World War. Hyde Park Cemetery contains a dozen war graves of fallen members of that regiment. During the formal (but brief) business of the Annual General Meeting, we shall elect the officers and committee of FoHPC for the next twelve months. While most of the existing committee members are standing for re-election, there are several vacancies, too. We have lots of ideas and aspirations for building on the great progress that we have made in the past few years, but we are constrained by the limited number of active volunteers that are available. If you have a few hours a month available and would like to help us to realise our ambitions, please get in touch. You can do so either by replying to this email or by calling me on 07777 688438. The meeting will also include a review of the Friends’ activities over the past 12 months. Free light refreshments will be available. The meeting is open to members and non-members. We shall be delighted to see you there.